This VNF onboarding lab uses pre-configured applications to demonstrate Cloudify functionality, to provide a rapid way to test drive the Cloudify platform with a typical NFV environment and experience first-hand how to apply automation to your different clouds and VNF services. 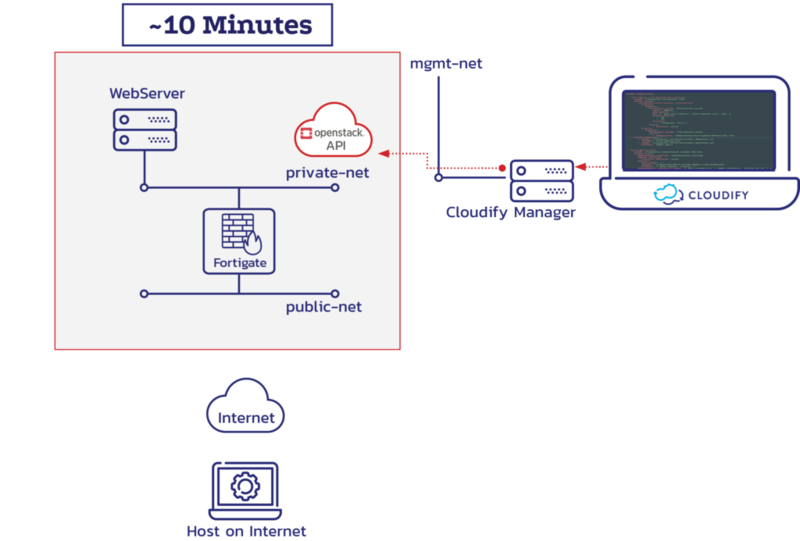 The solution package tells the story of an organization with a private Openstack cloud, Fortigate firewall with private and public networks, as well as internet connectivity that requires port forwarding functionality to provide controlled access an internal application (in this case an Apache webserver). Below you will find a detailed explanation for how to launch the lab, how long each phase takes and documentation for how to use it, and ultimately how you can then leverage the lab environment to demo Cloudify functionality in the remaining time (approximately 1.5 hours). VNF onboarding and management has proven to be quite a challenge in dynamic environments like the cloud. This lab scenario will enable you to create a preconfigured stack with all of the blueprints and plugins to first deploy a VNF to OpenStack and see it running with all of its networking configurations, next uninstall the VNF, and then create a deployment with multiple networks, port forwarding, and update the deployment configurations during runtime. The example can also be done in parts to incrementally learn how to work with Cloudify, and is divided into two separate parts for beginner and intermediate users. Click the link “Launch Lab” button on the VNF Management page. When the lab is finally ready, you can get started with the beginner scenario by clicking on the Cloudify Manager Link IP you will find under Application Outputs. This lab requires VPN connectivity to complete some of the scenarios. You can find the VPN Configuration Guide here for Windows, Mac, and Linux. Once you click on the URL you received by email, do not close the Cloudify Lab launch page browser window, as you will need some of the inputs provided on this page to continue. In the left menu navigate to Deployments. Find the “sample-openstack-vnf-infra” blueprint and click on it. Here you can view the deployment details and inputs, where there currently are no inputs under image_url or vnf_name. You can now navigate to your OpenStack dashboard. You can find the OpenStack Dashboard Credentials on the Cloudify Lab creation page under Lab OpenStack IaaS. In the OpenStack dashboard, you will be able to see that there are currently no VNF deployments running. 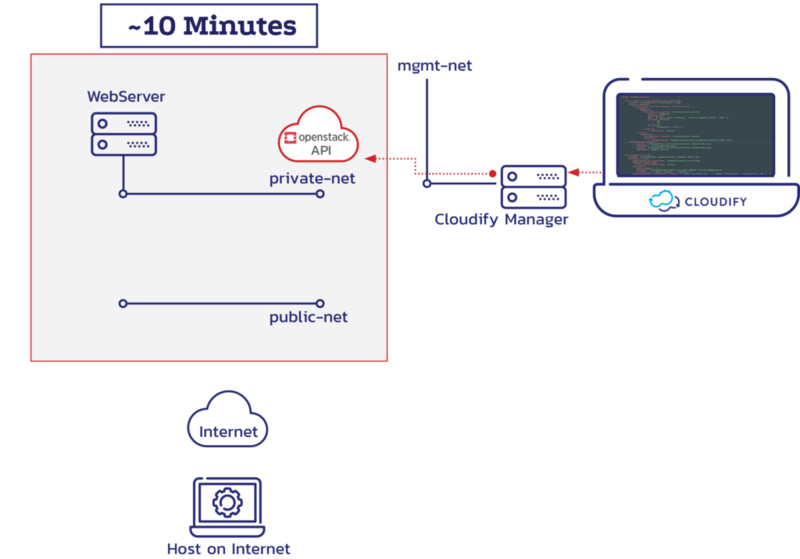 You will be able to see the private and public networks preconfigured by the Cloudify Lab. 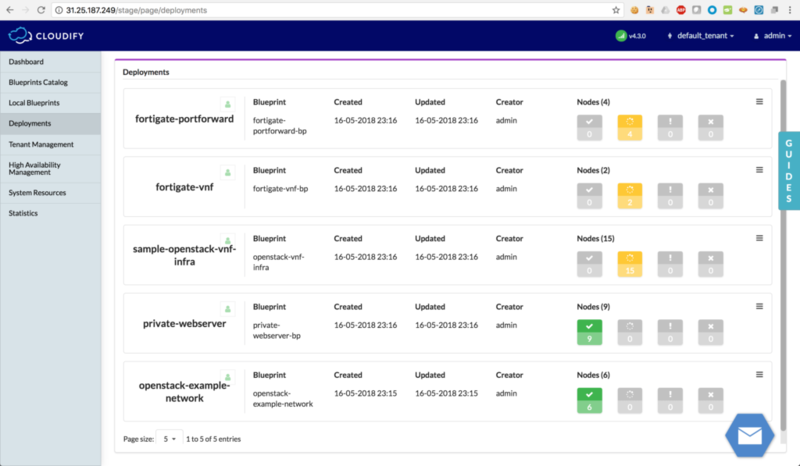 Navigate back to the Deployments page in the Cloudify Console, and find the “sample-openstack-vnf-infra” blueprint again. On the right side of the screen you will see a small hamburger menu associated with this deployment. Click on it and select Install from the menu. This will install the VNF service on OpenStack. Installation should take about 4 – 5 minutes. You can now navigate back to the OpenStack dashboard and view your running instance. Copy the vnf_mgmt_public_ip and paste it into a new browser window. You will need a running VPN connection to login to the management dashboard – see this guide to get one up and running. You may receive a safety error from Google. This is because the IPs are randomly assigned, and would require self-signed auto-generated certificates installed. You can continue safely by clicking on Advanced and continue to the IP address listed. You can login to the management dashboard by entering the credentials: admin with no password (i.e. keep the password field empty). You now have an OpenStack private cloud running a public and private network, and Fortigate VNF running with a baseline configuration. Play around with configuring your VNF. Navigate to Deployments and click on the sample-openstack-vnf-infra deployment. Your VNF deployment will uninstall and you will be ready to continue to the next lab scenario. This exercise will instantiate and configure the VNF so it’s ready to use. Find the “fortigate-vnf” blueprint and click on it. Again you can take a look at the deployment details and inputs, such as image_url or vnf_name, as well as inspect the blueprint hostname and VNF interface. In the OpenStack dashboard you will again be able to see that there are currently no VNF deployments running. Navigate back to the Deployments page in the Cloudify Console, and click on the small hamburger menu on the right side of the fortigate-vnf deployment. Click on it and select Install from the menu. This will install the Fortigate VNF service on OpenStack. Installation should take about 4 – 5 minutes. This will launch the Fortigate VNF on OpenStack. 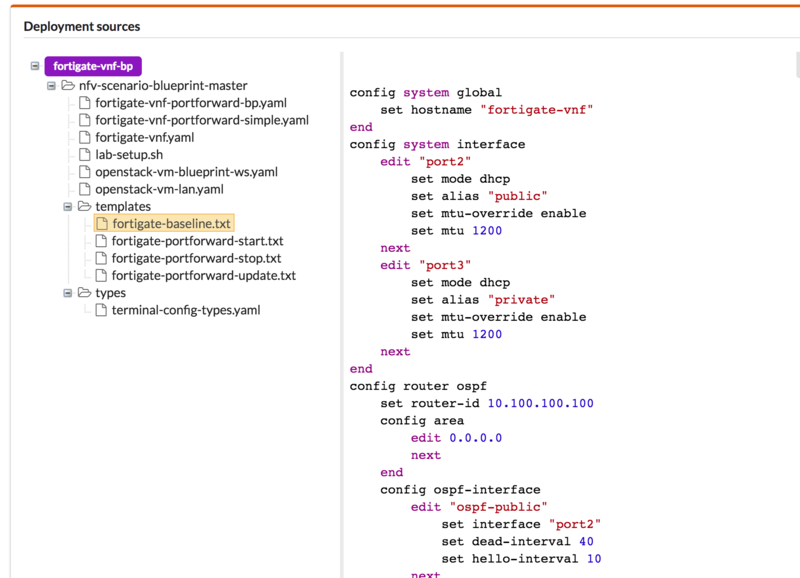 Navigate to the fortigate_openstack-vnf-infra deployment, click on it and scroll down to the Deployment Outputs, where you will find the management public IP to login to the Fortinet UI. Login to the Fortigate UI, again with the username: admin, with no password, to see the network interfaces configuration and application hostname running. Now we’re ready to configure port forwarding on the VNF. This exercise will configure the port forwarding service on the VNF. The port forwarding service will expose the “private-webserver” on the public interface of the VNF on port 8888. Navigate to the “private-webserver” deployment, click on it, and scroll down to the Deployment Outputs. 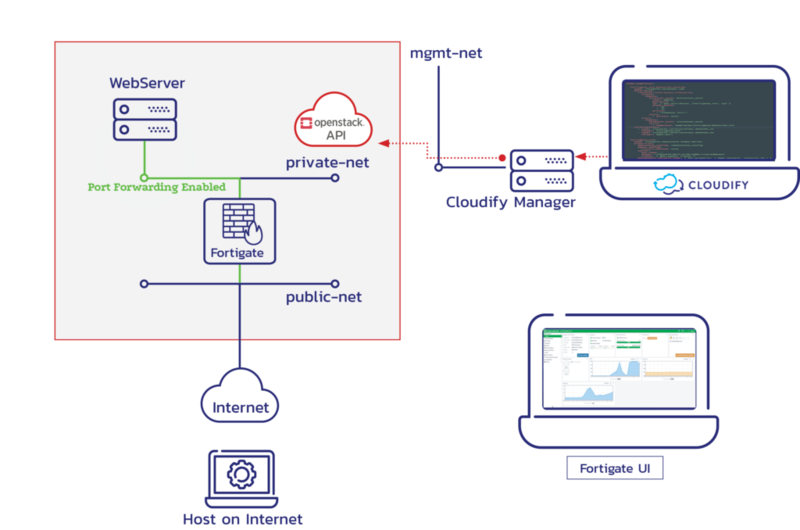 Run the Install workflow for the fortigate-portforward deployment. 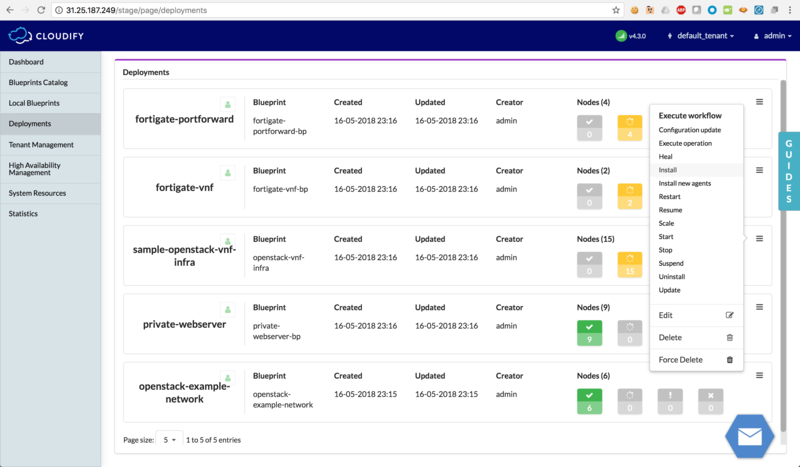 Navigate to the fortigate-openstack-infra deployment, click on it and scroll down to the Deployment Outputs, where you will find the management public IP to login to the Fortinet UI. Login to the Fortigate UI, again with the username: admin, with no password, to see the IPv4 Policy configuration, and the virtual IP configuration. 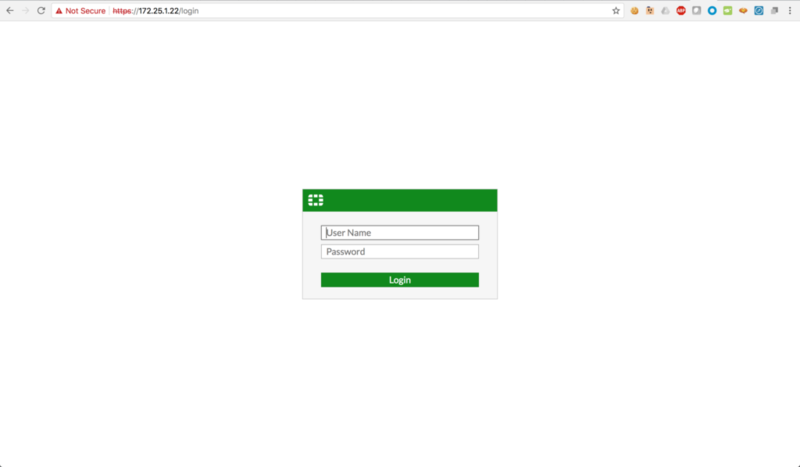 You can test the service to see it running live, by navigating to the Deployment Outputs under the fortigate_portforward deployment and find the test webpage’s port and public IP. 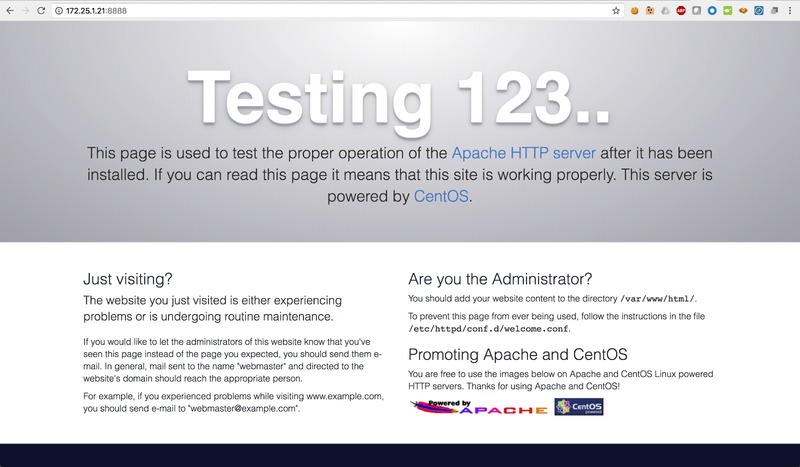 Past the IP with a colon and the port number, and you will see the webpage served by the webserver. Run the portforward_update workflow under the fortigate_portforward deployment. While it is updating you can view the page logs section to see the configurations being passed to the VNF. Once completed, you can navigate to the fortigate_portforward Deployment Outputs to see the new service_port. 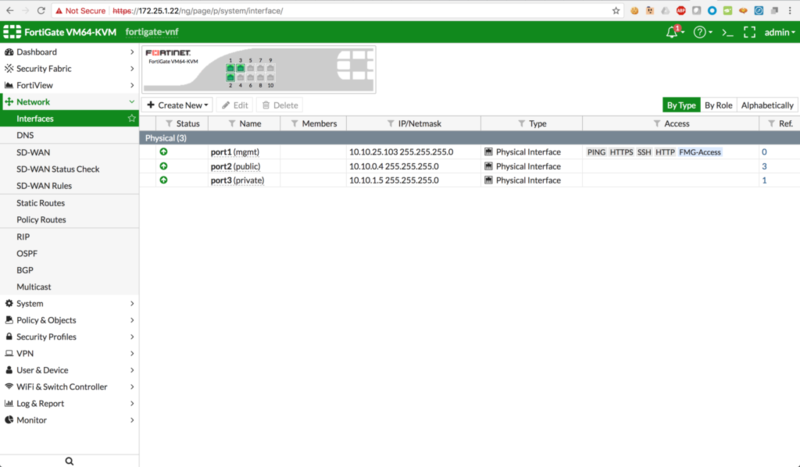 You can now once again paste the VNF Management Public IP (under fortigate-openstack-infra Deployment Outputs) into your browser and and view the IP configuration change in your dashboard. Navigate to Deployments and click on the fortigate_portforward deployment. Your service will uninstall and you will be able to find the service unreachable by trying to reload the webpage.